Great times and fun memories for your child all start with Amy & Delle! The kids play rug is the best bet if you're looking to have a fun and safe play space for your child to enjoy their favorite toys and games. Designed with amazing features to captivate your energetic bundle of joy and keep them laughing for hours! 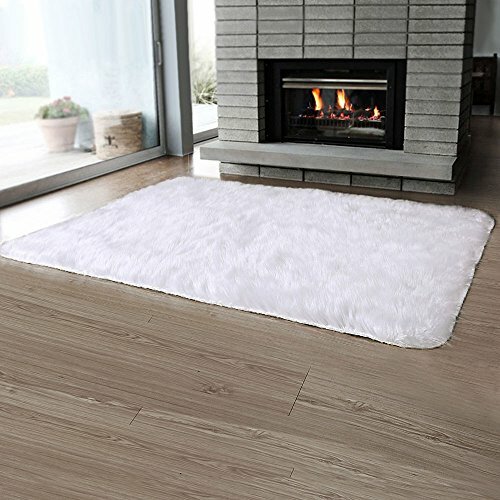 PRODUCT FEATURES Extra Thick Woven Rug Anti-Skid Latex Backing Large - 80" x 40"! Foldable or Roll-Up for Easy Storage Great for Playrooms, Daycares, Bedrooms and More! Busy City Design with Winding Roads and Bright Colors Interesting Features like Hospitals, Schools, and Airport to Promote Imaginative Play SET THE FOUNDATION FOR FUN Roll it out and get to playing! With this rug, your child will always have a reliable go-to area where they can play with their favorite toys and games. The design printed on the rug is made to promote educational and creative play. The winding roads all around this map allow your child to maneuver their toy cars, action figures, or dolls all around the busy city and go to school to play as teacher or go to the airport to visit a faraway land. PERFECTLY SAFE MATERIAL Safety is our priority and we make sure our rugs are upheld to the highest quality for your child to experience fun with no worries. Thick woven material makes sure your child can lay and stand on it without getting hurt. An anti-skid latex backing makes sure it doesn't budge when your child runs across it and accidentally slips. Let your child's imagination run free without worrying about if your child is near any harm! It's perfect for any home, playroom or classroom! Amy & Delle takes pride in creating fun and quality products for all children. 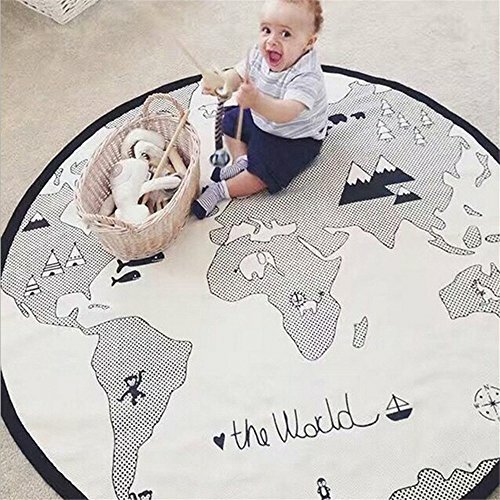 Get this play rug for your child this holiday season or surprise them on their birthday so they can always have a fun space to themselves to play! Extra Large Size! With Enough room for a few kids to play at once, it measure 80 x 40! Non-slip Latex back, keeps it safe for your kids! Material: Canvas Cotton, comfortable and skin-friendly. Diameter: 135cm / 53'', plenty big enough for kids to play games,and easy transportation when folded. Fun and practical design,keeps kids entertain for hours. Antistatic and environmental protection material,easy to clean. It's soft, and can be used as game mat, rug, baby crawl mat, etc.Great addition to any nursery, bedroom or playroom. Can also be used as a floor mat in living room, nursery, or even outside terrace or on the sand. Decorative play mat for your children. Baby and kids can sit on the mat and there is no worry to get cold. Cute Design:The special feature of the world's rugs is the beautiful illustrations of the rest of the world. There are kangaroos in Australia, African lions and elephants, penguins in Antarctica, the mountains represent the himalayas and more moods, cultivate baby's recognition of the brief contour of the world.Help your children know the world, increase curiosity about the world, and develop their intelligence. A huge size, this extra-large kids' rug can provide a more adequate play space for babies.. 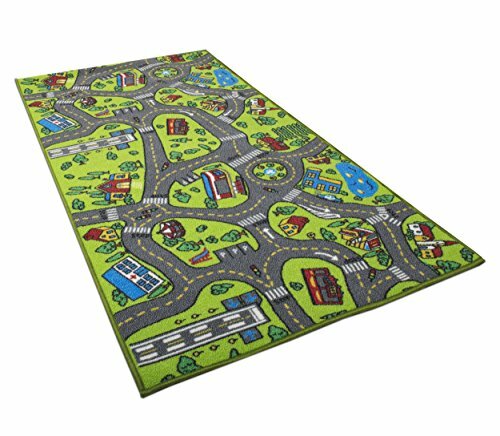 This city life map displays restaurant,Cafe,Park,Square,Police Station,Hospital,houses,stores and more.Accompanied by a road map and other city features, this kids floor mat will teach your toddler about infrastructure and navigation. The colorful city life rug is a wonderful birthday gift, Christmas gift and any other celebrating gift for kids.Perfect for School Classroom,Holiday Gift,Christmas Stocking Stuffers,Carnival Prizes, Party Favor,Easter Gatherings. This activity mat is also great for daycare, preschool, libraries, or any play and education facility. Toddlers, and little kids will adore the bright colors and it will guarantee good vibes in any space. Recommend age:1 years and up. Please feel free to contact us for any quality problem. kid carpet: It measure 32" x 52" large size, this extra-large kid' rug that more than one child being able to play together. It have enough room for boy and girl share toys and play together so they can have more fun! 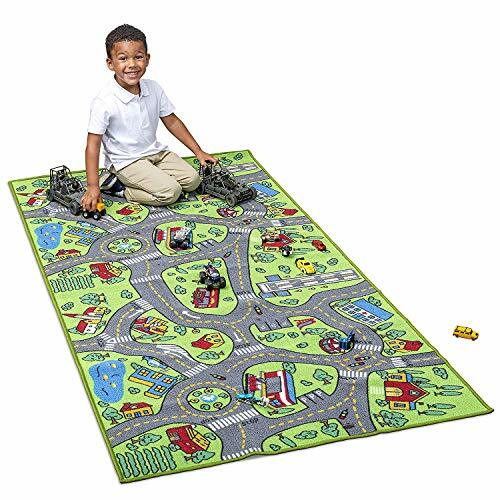 child play mat: This City Life Rug with vivid detail and bold colors,depicts streets cartracks filled with School,mart, hospital,houses,Airport, garage,police station,bridge, Park and so much more. 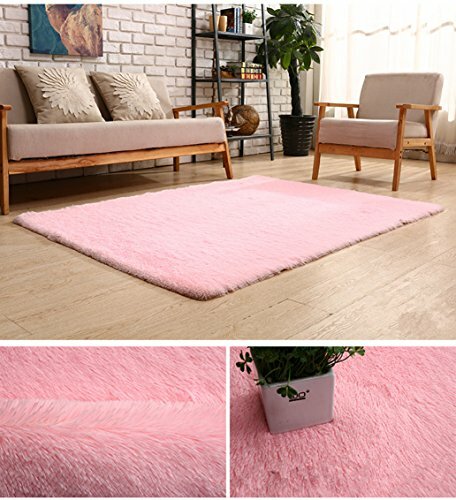 Rugs for kid: We suggest toddler at 1-year-old or older to use.It constructed with non-toxic,abs Materials to uphold the highest standard of health safety.You can contact us anytime! Level-up Your Child's Playtime We know you're a proud parent and are always thinking about how to stimulate your child's learning, development and creative imagination. There is not a more beautiful sound in the world, than your child's laughter. That's what motivated our decision to share kids playmat for kids with parents. Personal Space & Share At some point, every child from baby time desire to be indepandent and got their own space to have fun. This cotton play mat is one of the tools to make it possible and happy. 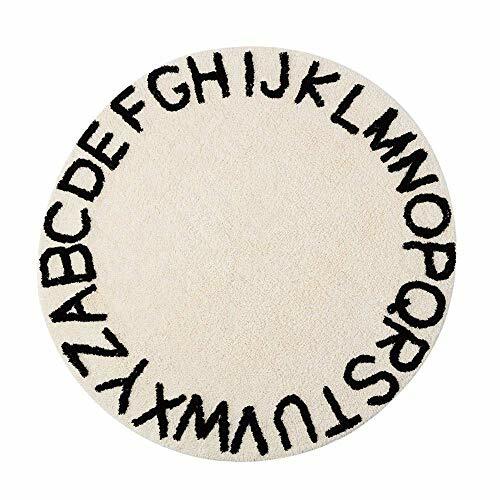 It allows babies and kids to play their toys or crawl in their own ground, the printed 26 alphabet help develop their cognitive skills as well as enhance their social and emotional development when they want to share their little play space with other little ones to built friendship and share happiness. Playing Safely Farewell to those shabby made mat and skin problems. A good cotton game mat provides a safe place to explore and play. This simple but well-made kids indoor outdoor game carpet offers your child/children a place to play, read, nap or use their imagination with a measure of privacy, but safely and never a few feet away from your watchful eye in the living room, bedroom, porch, yard or beach. Game Mat Care Instructions Your playmat may arrive with some wrinkles and odors since it is made from 100% cotton. You can lay it flat and press it for several times and put it outside some airy place for a few days, it will do very well. Machine Washable, DO NOT BLEACH, USE FABRIC SOFTENER OR DRYER. THIS Package INCLUDED : Playmat - Qty 1 ps: all other Decorations toys in the picture are not for sale. Invest in Your Child's Creative Fun Time with the Perfect Non-tv, Non-tablet, Non-laptop Gift. 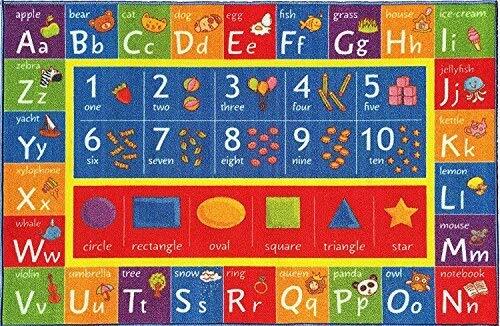 Order a lovely Alphabet Play Mat Today. A classic game takes a leap forward with this colorful, high-quality hopscotch game set! 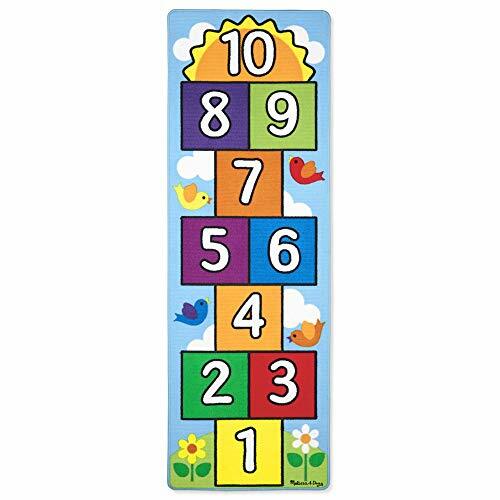 Featuring cheerful birds, fluffy clouds, and a rainbow of colors, this hopscotch rug offers lots of ways to learn and play. Reinforced border binding prevents fraying. Two colorful beanbag play pieces are included. The durable rug material is machine-washable. The skid-proof backing is safe on all floor surfaces and works for both indoor and outdoor use. The rug dimensions are 78.5 x 26.5 inches. The Melissa & Doug Hop & Count Hopscotch Rug features a classic hopscotch design and 2 colorful beanbags for hours of jumping and counting entertainment. This Melissa & Doug Hop & Count Hopscotch Rug makes an exceptional gift for kids from 3 to 7 years. Add the Melissa & Doug 4-in-1 Game Rug to round out the hands-on, screen-free play experience. CLASSIC HOPSCOTCH RUG: The Melissa & Doug Hop & Count Hopscotch Rug features a classic hopscotch design and 2 colorful beanbags for hours of jumping and counting entertainment. DURABLE MATERIALS: Our hopscotch rug is made from high-quality woven materials that can be used indoors or outdoors. The rug is machine-washable for easy cleanup. SKID-PROOF BACKING: This high-quality hopscotch game set features a skid-proof backing, ensuring safe use on multiple floor surfaces. GREAT GIFT FOR AGES 3 TO 7: This Melissa & Doug Hop & Count Hopscotch Rug makes an exceptional gift for kids from 3 to 7 years. Add the Melissa & Doug 4-in-1 Game Rug to round out the hands-on, screen-free play experience. 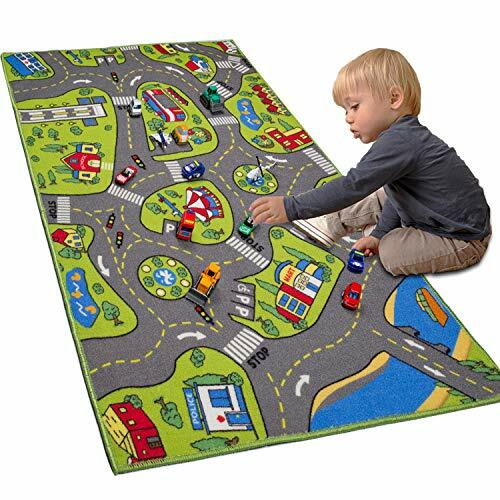 This colorful activity road rug comes with four cars to drive on looping streets and lanes -- and its varied terrain makes it ideal for trains, chunky play figures and vehicles of all kinds! Durably made to look great for countless playtimes to come, the woven rug features a handsome farm surrounded by a circular road system, which connects a school, a parking lot, a grocery store, a lakeshore, and more -- all in a convenient arrangement that makes it easy for kids to play. 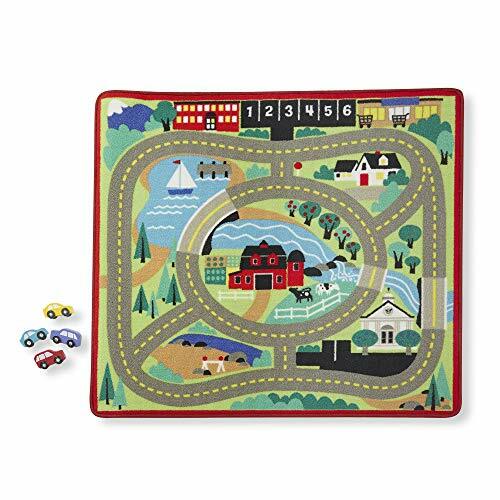 The activity road rug by Melissa & Doug includes 4 colorful wooden cars that can navigate past waterways, constructions sites, and schools. Each car can park in numbered parking spaces, which is great for counting and sequencing skills development. Our decorative car rug is made from durable materials that are machine-washable for easy clean-up. The play rug features a skid-proof backing that is safe to use on all floor surfaces. The Round the Town Road Rug & Car Set makes an ideal gift for kids ages 3 to 8. Add the Service Station Parking Garage to enhance the vehicle play experience. Our play rug measures 36" W x 39" L and weighs 3.5 pounds. 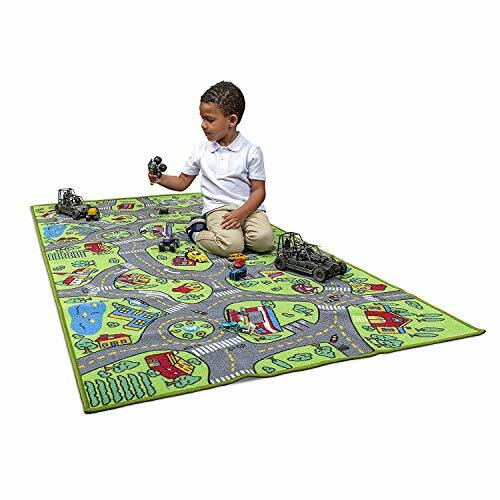 DURABLE AND DECORATIVE ACTIVITY RUG: Our Road Rug & Car Set includes a durable woven rug that features a handsome farm surrounded by a circular road system connecting a school, parking lot, grocery store, lakeshore, and more. SAFE FOR ALL FLOOR SURFACES: Our decorative car rug is made from durable materials that are machine-washable for easy clean-up. The play rug features a skid-proof backing that is safe to use on all floor surfaces. REALISTIC DETAILS: The road rug activity play set includes 4 colorful wooden cars that can navigate past waterways, construction sites and schools. Each car can park in numbered parking spaces, which is great for counting and sequencing skill development. GIFT FOR AGES 3 TO 8: The Round the Town Road Rug & Car Set makes an ideal gift for kids ages 3 to 8. Add the Melissa & Doug Service Station Parking Garage to enhance the vehicle play experience. 100% official merchandise Colourful LOL Surprise shaped floor rug Features Merbaby and Diva Size approx: 67cm x 86cm Non-slip backing 100% Polyamide with foam padded back Colour: Multi Coordinating LOL Surprise bedding and bedroom accessories available This beautiful LOL Surprise Shaped Rug makes a great addition to any LOL Surprise themed bedroom or playroom. 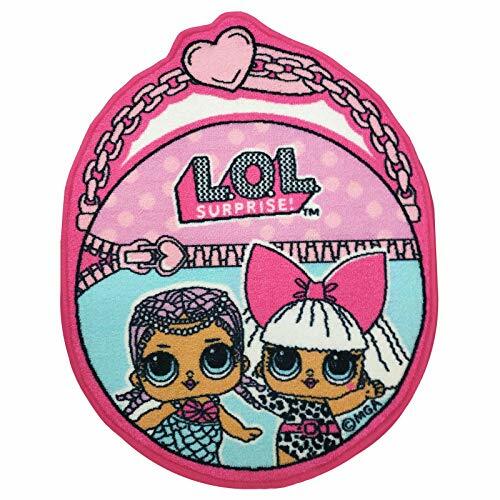 The colourful rug features Merbaby and Diva on pink and turquoise background. This rug also coordinates with other bedding and bedroom items we have available in our LOL Surprise range.